I have read that 90% of jobs in Information Technology are not in the high-tech industry itself. I certainly met one of those last week. I was riding up the Whistler gondola one day and one of the other passengers was wearing the official Whistler/Blackcomb jackets, complete with nametag. But instead of the typical nametag identifying which town in Australia he was from, it said "Information Technology". I asked and sure enough he worked in the IT department there. He said they had 22 full-time people supporting about 800 PCs and 40 servers, and were a Microsoft shop: SQL, Exchange, etc. In addition to the basic computers and the website, they also have a bunch of webcams, automated snow and temperature reports, automated snowmaking equipment...plus they scan your lift ticket with handheld devices that connect in realtime over a wireless network to check if your ticket is valid. Under all that snow are network cables connecting locations on the mountain. For example the Roundhouse Lodge, at the top of the gondola 6,000 feet above sea level, has a little business center. The guy I talked to was going up there to fix a few problems, including a printer that wasn't working. So he had a printer cable in his pocket and a snowboard in his hand, and after he fixed the printer he was going to ride back to the base. Not a bad job, I would say. So, as you may have noticed I added ads to the site. Mostly this is because I want BIG GIANT PILES OF MONEY ROLLING UP TO MY FRONT DOOR...err, excuse me, what I meant to say was, mostly this is because I am curious what happens. Curious as to what kinds of ads are served--will they provide me with some insight to my soul, as a Tivo does when it chooses what shows to record on spec? And curious about if a site like this will actually make any reasonable amount of NICE WARM FOLDING GREEN LUCRE...I mean money. Also if people get so annoyed that they stop reading. I chose Kanoodle because choosing Google would seem disloyal, and MSN Spaces recently chose Kanoodle. Kanoodle actually offers various programs, including dropping cookies onto users' machines, and putting ads in the RSS feed. I chose the most basic program, which is just putting 3 ads on the main page. We'll see if I'M MINTING MONEY FASTER THAN THE FEDS umm what I meant to say was, we'll see what happens next. I promise I won't change what I write about, meaning it will be the same unconnected collection of non sequiturs as always. And if you're wondering why the ads are on the left and there is a big gap between them and the text etc...it's because it's 11:30 at night and my CSS skills are pretty weak. Perhaps I'll tweak the layout in the next few days. Bill James, eminent chronicler of all things baseball and beyond, once made the point that major league teams over-value major league experience. (Major league baseball teams all have a network of affiliated teams in the minor leagues, from short-season Single A up to AAA, the level right below the majors. The major league team moves players up from and down to the AAA team as it sees fit.) When evaluating players, they view major league success as something that cannot be predicted from minor league success; some players "have it" and some players don't, and you can't tell which is which until you try. What this means is that teams who need a player at a certain position (because of injury, trade, free agent departure, etc) will tend to look for someone who has already "proven" themselves at the major league level, instead of to their own minor league system. Meaning, let's say your catcher gets hurt. Obviously your AAA team has a #1 catcher, and your AA team has a #1 catcher, etc. But teams will instead look around the majors for a catcher they can trade for, OR choose a player in the minors who has already been in the major leagues (famous players will retire in the majors, but less famous ones often wind up in AAA or AA for a while before they decide to hang up their spikes). What Bill James showed was that you can actually make reasonable predictions about someone's major league success based on their minor league record, once you adjust for the better pitching and defence they will face, the (usually) larger parks they will hit in, etc. Sure some people flame out in the majors, but major-leaguers also have unexpected bad seasons. James's point was that teams should look hard at their AAA players because it is likely that they can do almost as good a job as a "proven" major leaguer, and (important point) do it for much less money. For an example of this, take the Seattle Mariners. Please. The Mariners, still emerging from the dark days of Lou Piniella, have an organizational aversion to believing in the ability of their AAA players. They keep chasing after declining journeymen on the wrong side of age 30. Finally, last year, the team was so terrible that in desperation they called up a bunch of guys from AAA, and lo and behold some of them were pretty good. Of course the team didn't learn their lesson; in the off-season they went after more "experience", and this upcoming season would be poised to lose 162 games, if it weren't for Kansas City being in the league. The explanation is often couched in terms of the experienced players "knowing what it takes to win". Meaning that a kid in AAA, who presumably has been a star from Little League, through high school, and then in college or the low minors...never figured out how to win in all that time. "Oh wait, you have to score MORE runs than the other team? Dang!" The real explanation is that it is much easier to defend your choise when it goes wrong. "Sure Scott Spiezio is 97 and has no knees...but he won a World Series with the Angels! Honest!" Since we were in Whistler last week, we had a closer view of the national hand-wringing over the failure of the men's hockey team to win a medal. Much has been made of the selection process for the team, which also favored "experience" (previous internatonal play) over up-and-coming talent. Money wasn't an issue in this case, but the feeling was that with the bigger ice and compressed schedule, the young guns might have had more energy to keep up with the flying Finns (and Swedes, Russians, etc). I can understand valuing experience in a sport like figure skating where there is a brief stress-filled performance, but when playing 6 hockey games in 8 days, nobody would be a newbie for long. Anyway I was thinking about all this and it occurred to me that Microsoft might be suffering from a bit of the same problem. Meaning, when looking to replace a vice president (let's say), we look much more closely at current VPs in the company, or people at VP rank outside the company, than we do at current General Managers (who are one level below VPs). And similarly with replacing GMs with PUMs, etc. It's the same thing as with baseball teams; it may be more expensive to do it this way, but it's easier to picture someone succeeding if they already have elsewhere, and it's easier to defend your choice if something goes wrong. But that doesn't mean it's the right thing to do. Now, Microsoft in the past certainly has an admirable record of promoting from within. Most of the current crop of VPs and GMs started out as rank-and-file employees. But this could be an artifact of growing from 2,000 to 60,000 employees in the last 20 years, and growing from 3 VPs (or thereabouts) to 120 in the same time frame. Now that the company is growing more slowly, we can pick and choose whether to go for the "experience" or bring up someone from AAA. A quick look at the Mariners (and the Canadian men's hockey team) might be instructive here. Sound Transit is offering free wi-fi on some buses. Actually the only route they have it on right now is the 545; that's one of the buses I rode on my recent trip. I don't think that one had free wi-fi, although I have seen the buses with the ads on the side. I can't read on a bus without feeling nauseous, but it might be worth tracking one of these down just to say I sent email from a bus. With that, we're off to the snow for a week. I'll be back with more things to amaze, and in one case annoy, you. A follow-on to my bus expeditions from last fall. The local Audi dealer moved from its choice spot right near Microsoft's main campus off to one in the hinterlands between here and downtown Bellevue. So of course I needed to investigate how to get there by bus. A quick check of the Metro map reveals that bus number 233 goes within walking distance of the new location (it's north of Bellevue-Redmond Rd, on 124th Ave NE). The 233 stops on Microsoft's campus. But I was actually coming from home, so I would be leaving from the Redmond Park&Ride. The bus I would take from the Park&Ride would be the Sound Transit 545 Express which runs along 520. The 545 stops at both NE 51st and NE 40th streets. The 233, meanwhile, gets off the highway at NE 51st, goes west to 148th NE and turns south, then comes back east on NE 40th (the map at left is a detail from the Metro map). According to the schedule, the 545 stops at NE 51st at 8:54 and NE 40th at 8:58. The 233, meanwhile, stops at NE 51st at 8:56. So I figured it would be no problem to take the 545 to NE 51st, and then transfer to the 233 which would be coming along two minutes behind. When I tried it the first time, however, I missed the connection. The problem is that the 545 stops on the on-ramp to 520 after crossing NE 51st (green dot on the map). The 233, meanwhile, having come off the exit and turned right, stops on NE 51st (blue dot). So to connect you have to walk up the on-ramp back to 51st, and then (the crux of the problem) get across NE 51st to where the 233 stops. And of course the first time I tried this I was waiting for the light to cross NE 51st and here comes the 233 up the off-ramp, turns right on the red, and disappears down NE 51st without me. The 545 had since departed also, so I wound up having to walk the extra half-mile along the bike path to NE 40th, and then to campus. This morning I tried it again and I figured out the move here. You ride the 545 all the way to NE 40th and get off (yellow dot). 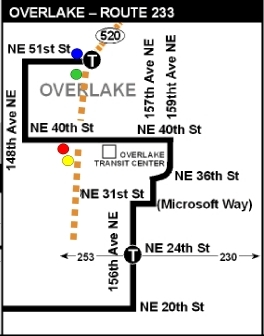 Then you board the 233 as it is coming back east on NE 40th (red dot). The key is you don't have to cross any streets (although the NE 40th stop is a bit further west than you might expect, because of Building 100 being there). Also, it is faster for the 545 to go between its two stops on the highway then it is for the 233 to ziggle past the Pro Club, so the connection is not as tight. In fact this morning as the 545 was crossing NE 51st I could see the 233 already on NE 51st preparing to turn left on 148th NE, so it was a few minutes ahead of where it had been the first time. But I was still able to continue on the 545 to NE 40th, then get off and walk to where the 233 stops on NE 40th, before the 233 got to the stop (I was helped by the fact that traffic backs up on NE 40th -- the light at the west end of the NE 40th overpass blatantly favors cars coming off the highway and turning left over those crossing the highway on NE 40th). As an added benefit, if you happen to miss the connection to the 233, you can lick your wounds and just walk to campus and then catch a later 233--you're not stuck out in the wilds of NE 51st. Someone was talking today about the numbers of servers that MSN uses. Basically a whole bunch, and a lot more coming. Now in the early days of data centers, it was considered a radical and mind-expanding notion to think of a server as a single component. Meaning that if anything on a server broke you just took it out, plopped in a new one, and only then did you bother to try to diagnose what was actually wrong with it (if you even bothered at all). In contrast with desktops where still to this day if the hard drive breaks you replace only the hard drive, if the network card melts down you replace only the network card, etc. (maybe some corporate desktops are not managed this way, but home machines certainly are). Fine, but now with the giant data centers you need to think outside the box, as it were. Because in the future you may want to deal with servers in units of more than one. So you might swap your servers out in units of eight, once, say, two of them stop working. Think of it like shopping for servers at Costco--they come bundled in multi-packs. To aid in wrapping our minds around this brave new world, I hereby propose that we (meaning everybody in the world) adopt the term "yard" to mean 96 rack-mounted servers. With this nomenclature, a data center with 200 servers would be a two-yard data center, a data center with 10,000 machines would be a hundred-yard data center, etc. 96 was chosen because it's a multiple of lots of numbers that servers tend to be racked in -- 16, 24, 48, etc (although racks seem to come in whatever random number of slots will fit a certain cabinet size, like 26 or 42). But, there is also the lovely imprecision caused by the 96-vs-100 factor. I like the fact that a K is not exactly 1000 (of course, I'm a big geek). Similarly, a yard is not exactly 100. But since it is less than 100, it tends to correct itself in large numbers. A kiloyard (1024 yards) is 98,304 servers, which is proportionally closer to 100,000 than 96 is to 100. And when you get up to 9 digits, a megayard of servers is 100,663,296 servers, which is pretty close to 100 million. Sure it's off by 600,000+ servers, but it's much closer than a megabyte is to 1 million, and nobody seems to mind that one. The book The Innovator's Dilemma is about a problem that can affect companies that take what is normally a good approach to product design: listening to their customers. The issue is that the customers will tend to ask for more bells and whistles on existing products--leading them "upmarket" in the terminology of the book--and this can lead to a more expensive, more feature-laden product that is prone to be replaced by something simple (or "downmarket") that is "good enough". End intro, begin main topic: I'm wondering if Microsoft may be leading itself into a different, but related trap. The current best practices for product design at Microsoft lean heavily on scenarios. Instead of designing features as such, we try to identify a customer scenario, and then figure out what features are needed to meet it. The idea is to avoid a) important customer scenarios that a product doesn't address and b) spending time on features that nobody will use. Those are worthy goals, and scenarios certainly help. In fact part of the reason for focusing on scenarios is to prevent the Innovator's Dilemma. Customers, when asked what they want in products, will often spout out features that they think will address a problem that they have, without thinking about whether it is the best way to address it. Forcing the customer to state the problem--the scenario--produces a more objective response and allows you to synthesize the scenarios into the set of features needed. So what is wrong? Well, consider the following imagined exchange between a Cool Idea Person (CIP) and a Scenario Enforcer (SE) in, say, early 2000. CIP: Hey, I think we should do a portable media player. SE: OK, tell me about it. CIP: Well, I think it should have some extras like a contact list. SE: Hmm, the scenario is playing music, right? Why would they need contacts? CIP: I don't know, it just might be useful for someone and it's just some extra software. SE: Well, we don't want features that are hunting for a scenario. Cut the contact list. CIP: Fine. Next, I think it should have just four buttons and a wheel for scrolling. SE: Only four buttons? What if the user wants to skip a song vs. fast-forwarding within a song? Those are separate scenarios. CIP: I see, but the four-button design looks kinda cool, and we can use the same button for two things. SE: Cool is nice, but we have our scenarios to hit. We need at least 10 buttons. CIP: Well, I suppose. Anyway, the last proposal is that we make the edges round. SE: Make the edges round? What's the scenario for that? CIP: There's no scenario for that! But it looks really great in the mockups we did. In our focus groups the round edges really got people jazzed about the unit. SE: Listen up ace, the music sounds the same, right? I don't care about the edges being round...round like an O...which is the last letter in scenario...which you don't have one of. So this is the problem with basing it all on scenarios. You try to design a portable music player using scenarios and you get...well you get something more like a Windows player than an iPod (discounting the Windows players that just imitate an iPod). Designing things around scenarios gets you a soulless, workmanlike product that does what it needs to do. But it doesn't get you something that delights a customer. And that's what were supposed to be doing, per SteveB: delighting our customers. Hit their scenarios, but then do that one extra thing, or do it in a more elegant way, or something, so they sit up and say, "Wow, this is great." Remember at one of the iMac launches where Steve Jobs looked at one and said, "Don't you just want to lick it?" In fact I talked about this in one of my very first blog posts, talking about "preciously seducing" technology (and even used the same Steve Jobs quote, although searching around he may have said it about Mac OS X, not the iMac, or not said it at all). Designing by scenarios doesn't get you the products that people want to lick, because there's no scenario for someone licking them. (Sorry, this one is internal only) So, go to the main internal Microsoft website. Then click on "Maps and Building Services" on the right (it's under the "CAMPUS" heading). Then scroll down and click on "MSWeb: Janitorial Services". Now look at the second section that has a title with a green background. Click on the plus sign next to the first item below. OK, interesting I guess...but now look at the next item with a plus sign next to it. Hmmmmm. What's up with that? Is it really necessary? And how do I get signed up? Somehow to me this is the most effective summary I have seen of how Microsoft has changed. Microsoft has posted an updated map of its campus expansion plans. If you compare it to the ones discussed a year ago, they are planning to keep more of the current sportsfields. Compare the JPG linked to above with this map from last year. On the older map, see the two buildings (or parking structures) right under the words "N.E. 36th St.", and then the building just below those. They are gone from the updated map, which is nice. Other than that the plans look basically the same except that buildings 7 and 99 now appear to have real designs (and the same design for both, in fact -- see picture on the left). Also, the Safeco buildings west of 156th, as well as one of the smaller buildings in West Campus, have changed labels from non-Microsoft to Microsoft-owned or Microsoft-leased. And the new highway overpass over 520 is still there. Here's a Q&A with some more links and details. I though this article about Airbus doing cold-weather testing of the A380 was interesting. Iqaluit (which is the capital of the Canadian territory of Nunavut, situated on Baffin Island a few hundred miles south of the Arctic Circle) has been chosen as the cold-weather test site for the new A380. It seems Iqaluit has a nice dry cold and they can depend on the weather being between -25 and -30 celsius (gak). A quick check of the current Iqaluit forecast shows it is a balmy -15, which I think is actually unseasonably warm for this time of year (the highs on this date the last 5 years have been -25, -9, -18, -20, and -25, and the lows...well, they've been lower than that). I went and saw the premiere of Seussical at Studio East last night. It was a great show. Yes I'm biased because my son is in the ensemble, but I really highly recommend it for families who like theater. The cast is excellent and the set is terrific. Most people who attend shows at Studio East are surprised at the quality of the shows, but "Seussical" had even long-time attendees marveling at how great it was. Here's a question: McDonald's sells Chicken McNuggets in quantities of 6, 9, and 20. If you want a specific number of nuggets you can usually order it...for example if you want 35 you can order a 6 pack and a 9 pack and a 20 pack, if you want 63 you can order 7 9-packs, etc. But you can't order some numbers: there's no way to construct 25 as a combination of 6, 9, and 20. So the question is, what is the largest number of nuggets that you can't order? OK, so that's just a basic math brainteaser. It's been discussed here and here and here and here and here (which points out you can now get 4 McNuggets in a Happy Meal, which throws everything into a cocked hat). It's even on Wikipedia claiming that "McNugget numbers" is a general term for sets of numbers made up of combinations of a fixed set of other numbers (the search for references is complicated by the existence of the Denver Nuggets basketball team, who have an annoying habit of employing 6 foot 9 basketball players who score 20 points in 43 minutes of playing time). Now, where did this problem originate? Well, check out out this issue of Focus, a publication of the Mathematical Association of America. Scroll down to page 23 (the 22nd page of the PDF) and look at the letter to the editor from Michael Barr, a mathematician at McGill University who also happens to be my father. That's me with the summer job at McGill 20 years ago, walking into work with my father. The story he relates did happen; I remember walking in to McGill and discussing this problem as we crossed the Rockland overpass between Mount Royal and Outremont (or maybe we cut through the fence and walked across the train tracks). We certainly thought it up on our own, but what's not clear is whether someone else had independently come up with the same problem earlier. McNuggets were introduced in 1983 and I graduated from high school in 1984, and in-between I managed to develop quite the McNuggets habit. My friend Val and I would talk about "splitting 20" -- meaning ordering a box of 20 McNuggets and then each eating half (one time we split 20 and then about an hour later went back and split 20 more -- the mind boggles). The summer job he refers to was indeed in 1986 so that would have been 3 years for someone else to spend enough time in a McNuggets-induced haze to come up with the problem. It's possible, I suppose, but like my father I choose to believe we were the first.